Thanksiving is ONE week away – can you believe it?? Next week, I will be busy baking pies and all kinds of things, cleaning, and preparing for a big family meal as I am sure some of you will be doing as well. I really want to have my table settings and decorations all done by that time. 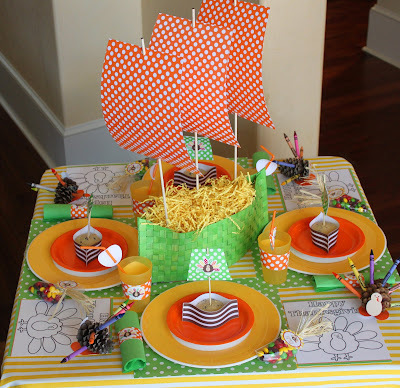 So I was looking up ideas for a kids table and thought I would gather them all together in a post and share them with you. My nieces (now 5 and 3 and I also have a 1 year old nephew now too) LOVED having a kids table all decorated for them last year. They loved coloring on the paper tablecloth and placemats so I definitely plan on doing that again this year. And I have a few things I plan to do with them this week that we will use on our table next week. 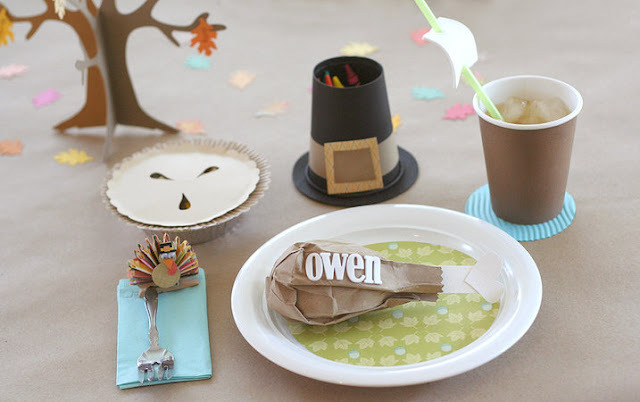 There are tons of ideas online for Thanksgiving Kids tables – here’s a few I found on Pinterest and around blogland. I love this idea! In fact, I think I will be making this with my nieces on Friday to have on our table. Find the tutorial and the free printable for the turkey pieces on the pinecone turkey crayon holder at Amanda Parker and Family. Here’s the table she created – find the printable for the Mayflower on her site too. 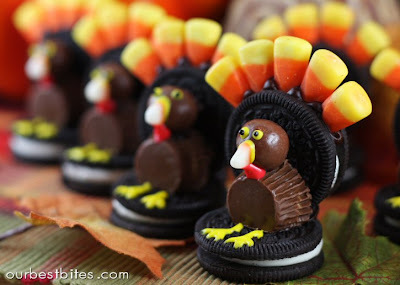 And how about some edible turkeys! (if you can keep the kids and the adults from eating them long enough to be decorations!) Tutorial on Our Best Bites. For the older kids – this Pumpkin Tic-Tac-Toe game from It’s Overflowing is a fun idea. 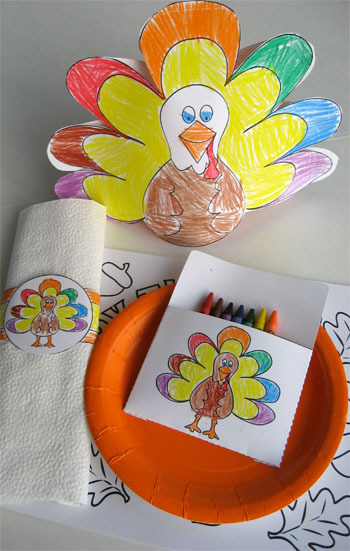 This Turkey Day centerpiece from Parents.com is an easy idea that doesn’t require a lot of crafting. Another great kids table from Be Different Act Normal. Here’s some ideas that the kids could color beforehand and then have a placemat to color that day. Free printables available on Alpha Mom. Another simpler idea from Hip Hip Hooray Blog. This was actually published in Southern Living Magazine! This Thankful tree would be fun to display on a wall or kitchen door leading up to Thanksgiving. Check out Ask Anna for the tutorial. 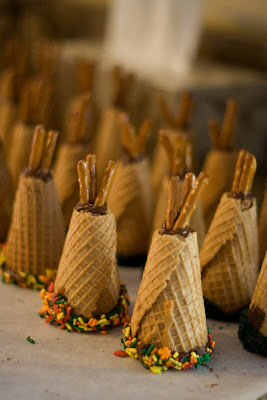 This fringe tablecloth idea from Martha Stewart is easy – I did something like this last year with some white paper. This table setting from the Fiskars website is darling! I love the paper turkey leg! I used some of the printables from Paper Glitter last year on my kids table. And this kids table is probably my favorite! Just so pretty although probably a little more than I have time to accomplish. From Living Wright at Home. And how could you now love this Pottery Barn kids table? Or this one from Pottery Barn Kids? Do you decorate a kids table for Thanksgiving? I did for the first time last year. Here was my kids table. My nieces loved being able to color on the tablecloth. And they loved that there was a table decorated just for them. Hope you got some ideas! Would love to see what you do if you decorate a kids table for Thanksgiving. Love these. I’m excited to be home for Thanksgiving this year and I’m hoping to do some special things with just our family. Thanks for sharing. Loved these ideas! My kids will be the only ones present at Thanksgiving dinner this year and we were asked to bring table decorations. Many of these ideas will be fun to use as decoration and distraction! Thanks!